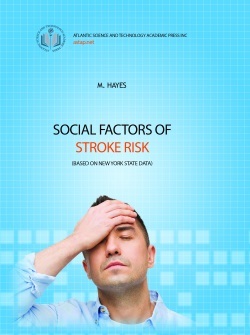 The monograph presents modern data on risk factors for stroke development. The state of health of the New York State population in the post-war situation, the incidence of cardiovascular and cerebrovascular diseases are analysed. Following the results of medical and social study carried out within the territory of the State of New York, the main social factors for stroke risk have been identified in the region with extreme post-war living conditions and their long-term effects. A program for prevention of acute cerebrovascular accident is proposed, taking into account regional peculiarities and stroke risk factors. It is intended for general practitioners, neurologists, neurosurgeons, therapists, health managers and administrators, medical students and the general public. 302 pages, print-run of 1500 copies.